YOUR JORDAN ADVENTURE STARTS HERE! The journey was unforgettable and it was all thanks to our amazing guide...thank you Terhaal for putting together such wonderful memories for us. We spent 3 nights in Jordan. While it was a short visit, it was so well planned that we felt we saw and did everything we wanted to. Terhaal Adventures was wonderful to work with. Wafa'a was excellent in planning the trip for us and very easy to communicate with prior to traveling. He was always very quick to respond and helpful with any questions. Our guide, Mohammed, was excellent! He was very informative and took us to great restaurants and extra stops. He was very friendly and made our trip even more fun. This trip was one of our favs!! I recently completed a one-week cycling trip operated by Terhaal Adventures. 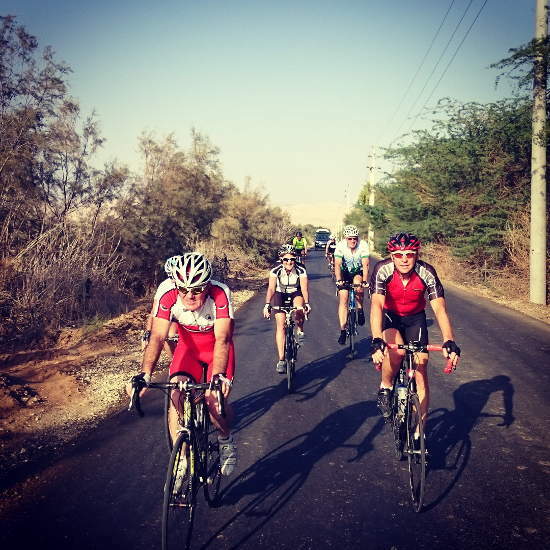 There were 8 cyclists in our party, and our tour took us to Madaba, the Dead Sea, Dana Village, Petra, and Wadi Rum. I found Terhaal to be a well run and highly professional operation. Our excellent tour leader was Anas Beltawi, a professional cyclist who designed the overall tour and the various cycling routes himself. Anas is bright, personable, funny, and a joy to be with. He runs a great tour and takes good care of you! There is a lot of value packed into this cycling trip, and I highly recommend it. The destinations were spectacular which is no surprise. However, it was the cycling experience that made the tour more unique and memorable: placing you directly onto remarkable trails, villages, and landscapes. The dirt, the sounds, the smells. The friendship and camaraderie of your fellow cyclists. You get it. Note the cycling was challenging at times, and each day contained one or more moderate to difficult ascents. Therefor, you need to have a good level of fitness and cycling experience to best enjoy this tour. As for the members of our party, we all thought the tour exceeded expectations. 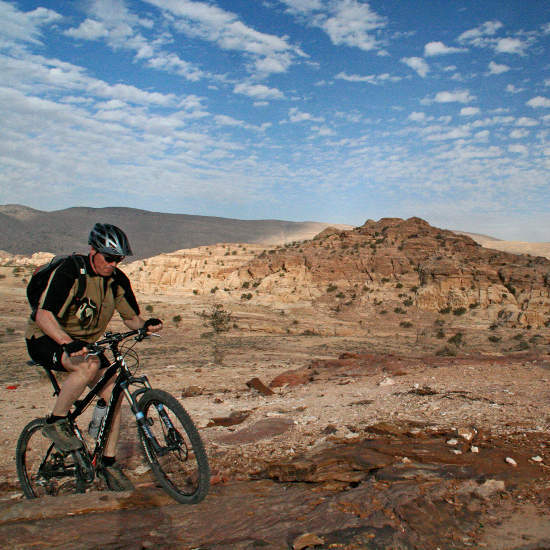 So go to Jordan and to the biking holiday, you'll be glad you did! "This holiday was my first with a tour company and what a way to start! Terhaal were amazing to travel with. They catered for all of our groups needs. The guides Atef and Mohammed worked so hard to make our holiday a truly memorable one. They were always on hand 24/7. Terhaal were a very professional company and offered great value for money. 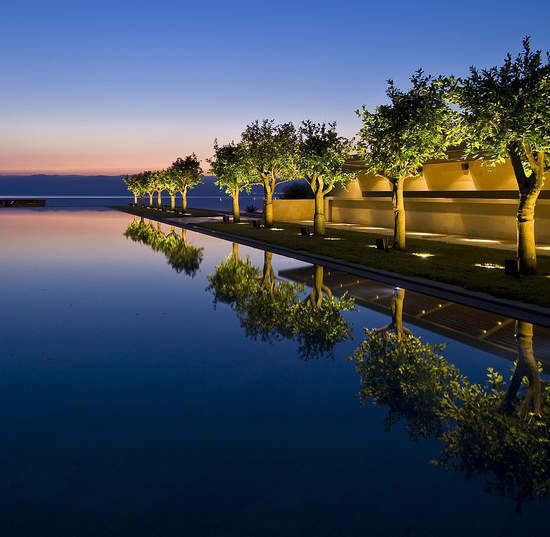 I would highly recommend them to anyone looking to travel in Jordan." 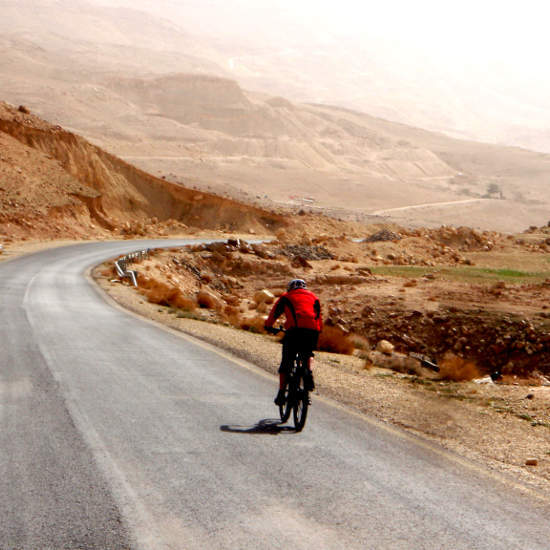 "Ten "mad Irish" went on a cycling tour to Jordan with Terhaal Adventures. From the initial planning to the final day of our incredible memorable visit. The personnel in Terhaal were professional, reassuring, caring and they fulfilled their duties and responsibilities way beyond our expectations. I cannot fully praise and give credit to everyone in the company for the expertise and kindness we were shown. Our link person was Haya Bishouty and she devotailed all the managament aspects of our trip to meet our needs and requirements. This included, accomodation, food, and the rich, varied and historical experiences we had in this incredible country. Haya was exceptionally corteous and painstakingly patient. We were met at the Airport in Amman by the wonderful, knowledgable Athef who was our guide during the trip. Athef drove a 4x4 jeep with our bicycles strapped on. He introduced us to Mohammed, a cyclist with the Jordanian national team who cycled with us each day. We were also introduced to Alii, who drove the bus. Athef is an incredible guide. His army experiences shone through during the trip. He was organised for all eventualities. He pushed each individual to our comfort limit. He was our guide of all places of Historical interest. He fixed chains, tyres and punctures, cooked lunches in shady woodlands and introduces us to Bedouin families as part of the company's responsible tourism. His genorisity and energy was boundless and he responded to all our request immediately. Mohammed was excellent as our cycling guide. He kept us together and made sure that we cycled on terrain that we could easily manage. Ali, our bus driver, along with Athef drove behind us and picked up those of us who felt tired or required a break. Each morning the bus was clean, pristine, and fresh for that day's journey. These three gentlemen built up a great rapport with our group. They were there for us 24/7. Any issue no matter how small was dealt competently and quietly by them. Their patience and kindness was boundless. The Jordanian people whom we met were most welcoming. The experiences we had,(hurtling down STEEP hills, cycling on rough terrain, cycling in the desert, climbing through tunnels, visiting Petra, guided tours of the crusade castles, snorkling in the Red Sea, floating at the Dead Sea, scrubbing in the Turkish baths, sleeping under the stars in Wadi Rum, the list is endless), were unique and unforgettable. I don't take the time to write reviews, but in this case, if you have a mind to go to a middle-eastern country, and you want to walk on the path where civilisation began, and to experience the biblical stories of John the Baptst, Jesus, Soddon and Gomorrah etc, then I urge you to contact Haya Bishouty and her Terhaal Team and place your trust in them to organise for you the holiday of a life time. You will not be making a mistake." 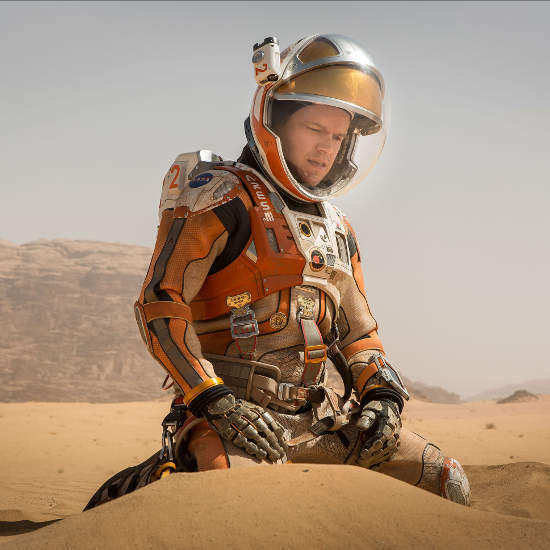 "My recent trip to Jordan has been an unforgettable experience. A big thanks to Terhaal Adventures who organized an amazing tour through the entire country. Initially we booked a five day trip including Petra, Wadi Rum, Dead Sea, Ajloun and Jerrash. When we then spontaneously decided to amend the trip to include Aqaba and the red Sea, Terhaal rearranged everything to meet our expectations on a really short notice. While all the different regions are very diverse, they do have one thing in common and that are the friendly people whol always aim to make you feel welcome. Jordan is definitely worth a visit!" "My friend and I had a fantastic week in February all arranged by Terhaal. The tour was enjoyable and well paced and our tour guide Murad was very good, not only was he knowledgable and friendly but he was patient and understanding when some of us in the group were struggling on some of the hikes. We particularly enjoyed our time in Wadi Rum, it was an unforgettable experience. Terhaal is a great company and catered for our needs well. A wonderful experience and I hope to visit Jordan again very soon." "Fantastic 7 days in Jordan around Xmas. Even more enjoyable as the logistic was fully and professionally taken care of by Terhaal (right choice of activities and hotels, great advises). The driver is optional but it makes your life easier and safer. The hot air balloon is, however, a must! 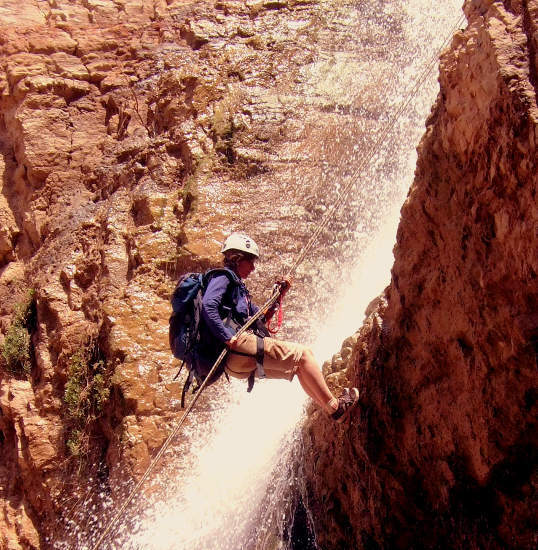 "My five days with Terhaal Adventures - canyoneering, walking Petra and exploring Wadi Rum was outstanding! Their guides had just the right level of "guiding" versus leaving me on my own. The level of physical challenge left me with eyes wide open - sometimes wondering if I could handle it. Perfect! 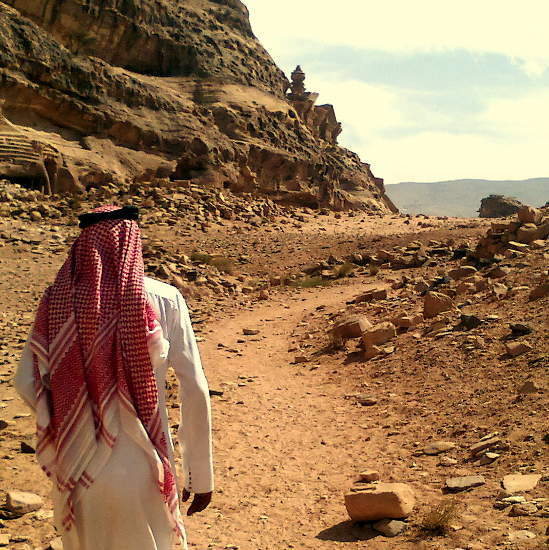 Jordan is a place I will recommend to everyone I share stories with of my world trip - Terhaal is the best facilitator of a trip to this incredible country." 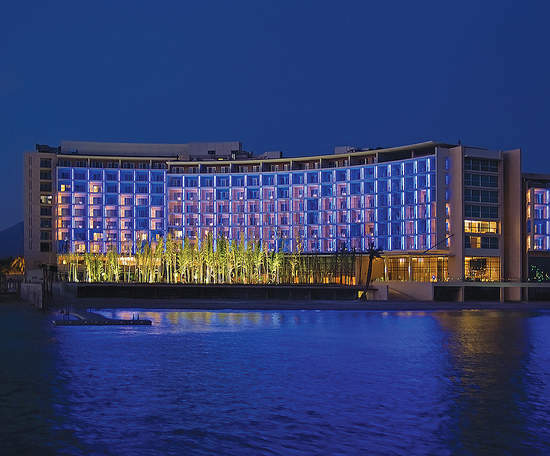 "It was only 3 days we (my husband and I) booked with Tarhaal, but they organize it excellent. Lady-representative listened very carefully to what we wanted and transfer it to program to fullfill our needs. we enjoyed our trip from the pick- up to the drop-off. Petra and Wadi Rum were of course the highlights of our trip and suggestion to stay in Wadi Rum overnight in Beduin camp was absolutly fantastic. "My wife and I enjoyed a hot air balloon ride in the Wadi Rum desert. We booked the adventure from Canada and were not disappointed. The overall time was three hours and we watched them inflate the balloon before the sun came up. I was a wonderful experience." "Definitely use Terhaal as your travel company! They were great, and worked with us to create a custom trip exactly the way we wanted it. We simply stated our needs, they put it together and worked out the details. We're lucky we chose the option with a driver too. Our driver Fadi turned out to be indispensable - translator when needed, knew the in's and all the good places, and helped us in every way. He was a great personality, and proud to show us his country. When my girlfriend came down with a stomach infection during the trip - no one's fault - our driver was amazing and got us through it (driving to the clinic, the markets, translating, etc). 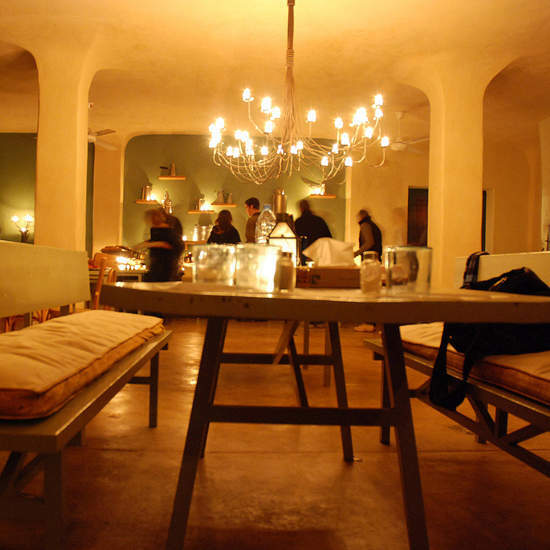 Terhaal did their best to also change our bookings on the fly because of it. They were completely cooperative. Great company! And see if you can get Fadi as your driver." "We have been biking in Jordan and especially the off-road section and biking through the desert we have enjoyed very much, and this was the main reason for selecting this trip. 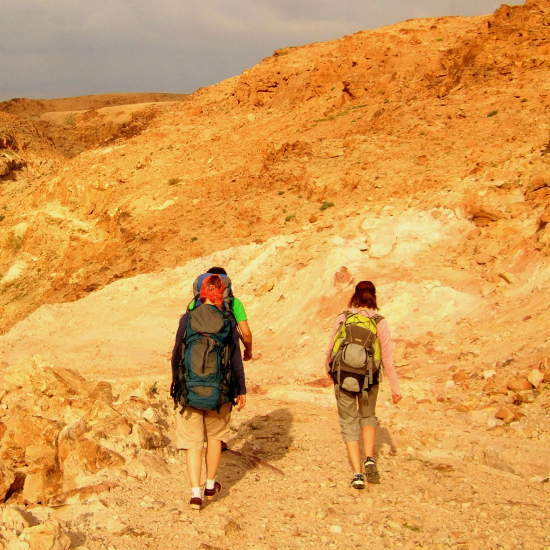 It was also good to make side trips to historic places like Mount Nebo and Mukawir Palace as well as a trip to the Dead Sea.We have been very pleased with the professional guidance and detailed and accurate program"
"The trip was amazing and the group of trekkers made the trip so enjoyable. I did start to feel ill on the last day and think it was something I ate. Luckily it wasn't too bad and I was able to make it home.I would add more strongly written language regarding the need for warm clothing at night. The current information suggests a fleece jacket but quite honestly, this is not adequate and will become less so as the weather gets colder. A heavy fleece, warm jacket, gloves and fleece pants are the minimum." "I always enjoy meeting new people from around the world on these treks. We laughed by the campfire every night sharing travel stories and reliving the days trek. I try to spend as much time as possible getting to know the local support crew. I felt especially honored to be given a Bedouin name by the support crew. They invited me to participate in the evenings' dances and made me and the other trekkers feel very welcome. It was great to finally see Petra in person. The challenging hike through the canyon to arrive at the front gate of Petra was one of the highlights of the trek. Yousef was a great trip leader. He shared his knowledge of Jordan's history throughout the trip. He was entertaining and made sure we were all having a good time. Trekking in the desert can be tiring with the sun beating down on you, but Yousef seemed to know where every shaded tree was located for us to get much needed relief from the sun. The support crew out did themselves. The meals that we ate at dinner were something that could have been served at a first class restaurant. The chicken on the grill, fresh goat(always deliscious) and local chicken dishes accompanied by locals salads and hummus were delicious. The crew were all very friendly and shared their Bedouin customs with us. It was all good fun.One minor suggestion would be to stay at a hotel in Petra with a liquor license. After a week on the trail we were all looking forward to a glass of wine with dinner, but our hotel did not serve alcohol. Not that big of a deal." "I would suggest that Salam's camp is pictured on the website as a 'typical site' in which Terhaal guests might expect to stay. Accompanied with an explanation that this is the most responsible and sensible way of spending the night in the desert. Salam was particularly considerate as he made a big effort to get us out of the Wadi for us to begin the drive to Amman in time for our flight. Salam was great, with a fantastic sense of humour. Our whole group of 4 had an outstanding, brief trip. We all really appreciated the extra time and effort which Layali had gone to in order to accommodate our specific requirements, tweaking the itinerary. We made it all the way up to Amman Airport with plenty of time to spare!" 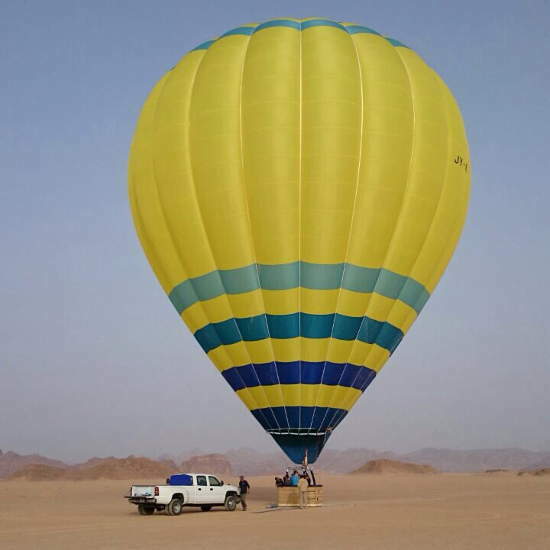 "A balloon ride is the only way to view the entire Wadi Rum, it was breath taking would recommend to any one, camp accommodation is basic to say the least!! would consider getting up early and driving there next time.."
This is a fun hiking tour covering the major sites of Jordan. Amazingly diverse trails; ranging from Mediterranean forest to fabulous desert. A wonderful honeymoon nature retreat in Jordan! Float at the Dead Sea, relax in Ajloun, a romantic candle lit escape in Feynan, tour the wonderful city of Petra, camp in Wadi Rum and explore the wonders of Amman. 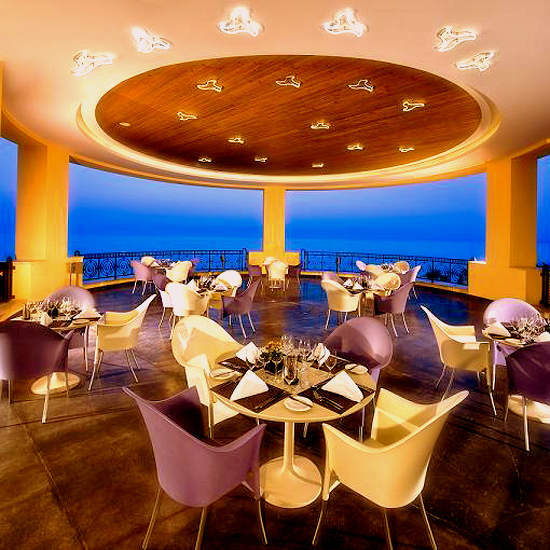 A fabulous seaside honeymoon getaway in Jordan! 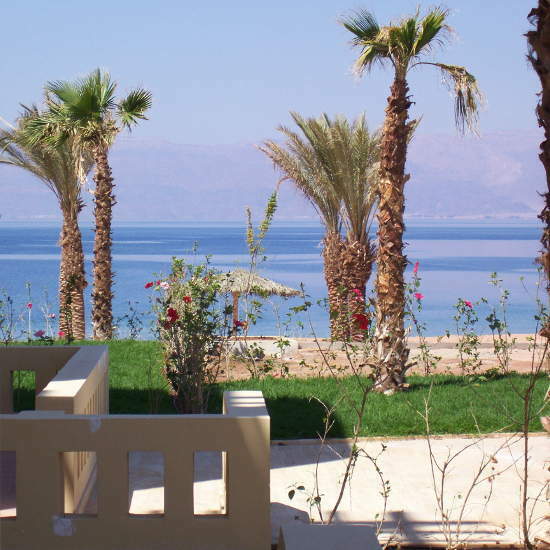 Three nights at Dead Sea. Three nights at the Red Sea. A day at Petra & many optional to choose from. Ends with one night at a natural hot springs resort. This adventure takes you through the highlights of Jordan. Splendid balance of nature, history and culture. 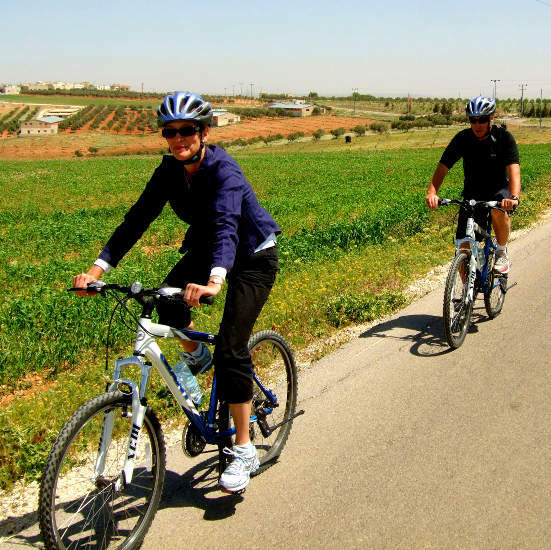 Biking on scenic back roads with views down to the Jordan Valley and the Dead Sea, you'll ride from the lively town of Madaba to the fortress at Mukawir, where John the Baptist was imprisoned and beheaded. Here you'll have dinner with a Jordanian family in the village. A day hike through a scenic trail all the way to the Monastery. Off the beaten track and full of hidden Petra treasures. Visit the Calligraphy house and the Soap House. Lunch with a Local Family. impressive little canyon by the Dead Sea. Hike along a water stream a 20m waterfall. 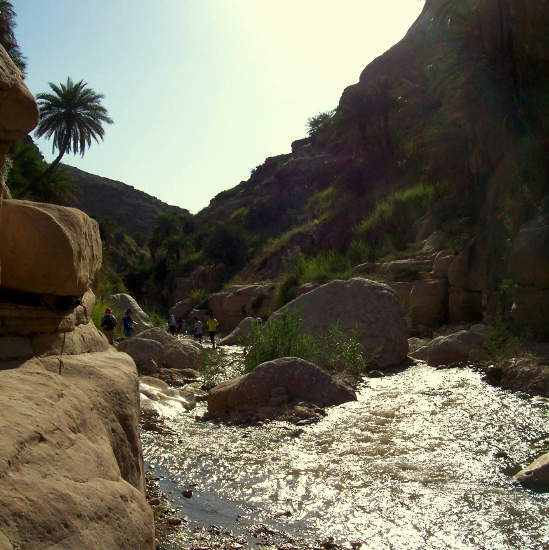 Walk in water through a deep sandstone gorge of Wadi Mujib. Experience Jordan's most famous river canyon! Canyoning near Madaba through a black basalt canyon. Fantastic trail hike alongside and in a water stream. Two impressive waterfalls to abseil. A great sandstone Canyon that ends at the Dead Sea. Good for beginners, with abseiling down a 20m waterfall. A cool year round water stream, many little waterfalls and dense vegetation of wild mint and reed throughout the hike. Very impressive and pleasant Canyon, near Karak. Abundant with water springs and hanging gardens. Ends with a visit to the Crusader castle Karak. Two way route with no abseiling. 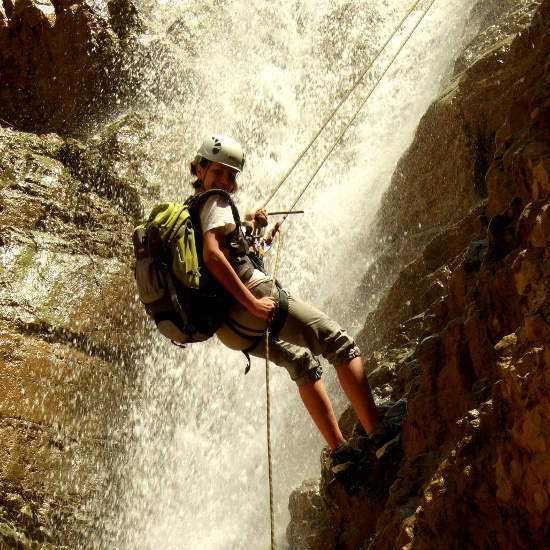 A two day Canyoning experience next to Kerak. Spend the night camping inside the canyon close to a waterfall.